When it comes to your oral health, we here at Balboa Victory Dental want you to have as much information as possible. While everyone is aware that a consistent oral hygiene regimen is essential, there are other ways that you can help to protect the health and integrity of your teeth and gums. Some of these alternative methods to protecting teeth are well known, such as using mouthwash at least once a day, eating foods that are rich in calcium such as leafy greens and milk, and avoiding soda as much as possible. 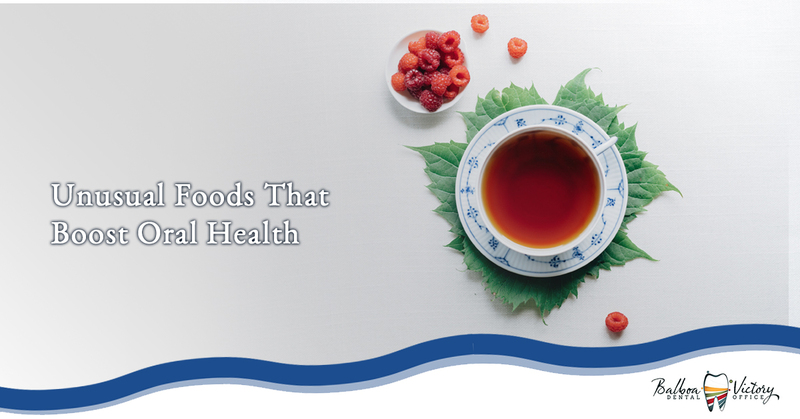 In today’s post, we are going to list a few foods that are lesser known in relation to boosting your oral health. Continue reading below to learn more. Making sure that your gums and teeth are as healthy as possible is always in your best interest. Not only does a healthy mouth make it easier to eat, it also means that you are much less likely to suffer from the side effects of gum infections, abscessed teeth, and many other oral health risks. Below, we have listed a few foods that you can consume to help make sure that your teeth stay as healthy as possible. Cinnamon: While we aren’t suggesting that you shove a tablespoon of sugar in your mouth (after all, the cinnamon challenge is so 2012), researchers at the University of Illinois in Chicago have found that a key ingredient that gives cinnamon its color and flavor, cinnamic aldehyde, works to reduce the amount of bacteria that is present in the mouth. Adding a little bit of cinnamon to your morning coffee or chewing cinnamon gum that has been naturally flavored could keep your bacteria at bay and help to reduce the chances of tooth decay and gum disease. Tea: Throughout history, tea has been revered by many cultures for its calming effect on the mind, flavor, and medicinal qualities. Recent research has revealed that tea has also been helping people reduce the amount of bacteria that is present in their mouth. The flavonoids in tea, work to prevent harmful bacteria from sticking to teeth and help to block the natural production of a type of sugar that can cause tooth decay. On top of all of this, many tea varieties are high in calcium, a substance that teeth can never get enough of. Join us again next time as we continue to cover some unusual food substances that can help to increase a person’s overall oral health. Additionally, if you are in need of a dentist in the Encino area, please do not hesitate to get in touch with us at Balboa Victory Dental Office. We have been helping Encino area residents with their oral health needs for years and we are certain that our knowledgeable, experienced staff can help you make sure that your oral health is as good as possible. Contact us today and let us show you why we are a top rated local dentist in our area.